Every year, Pantone’s colour gurus and trend watchers pick the colour that best represents our zeitgeist. This year’s hot new colour? Coral! These stunning varieties make our hearts flutter. Coral Charm is one of the rare peonies that change colour over time. After a day or three, this peony will slowly start changing from teaberry pink to living coral. Give it some time, and Coral Charm keeps transforming until the ultimate finale: a vibrant cream colour that takes you by surprise. In all honesty, a picture doesn’t do Coral Charm justice. Let’s say it gives you a hint of what this enchanting charmer looks like! Some peonies turn superlatives into understatements. 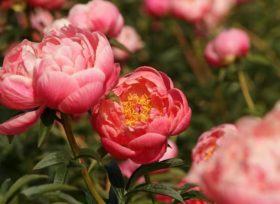 Lois’ Choice is a near impossibly stunning coral peony. In bloom, her flowers transform from tiny rosebuds into enormous balls. With her breathtaking colour and mood-raising personality, the ever-popular Lois’ Choice is always in high demand. With Living Coral being this year’s hottest colour, there might be a rush for this belle of the ball. And understandably so. Who doesn’t dream of a coral coloured sunset in the Caribbean? Add a pool lounger and maybe a bottle of rum and we’ve got everything we could ever desire. Well, almost. Because there’s one flower we’d rather have, still: Coral Sunset is a beautiful orange peony that is a flower-shaped summer holiday. Hybridiser Samuel Wissing gave Coral Sunset its name in 1965. Today it’s as fresh, cool and trendy as it was back in the sixties, and Coral Sunset could become the crown jewel of many bouquets this year.